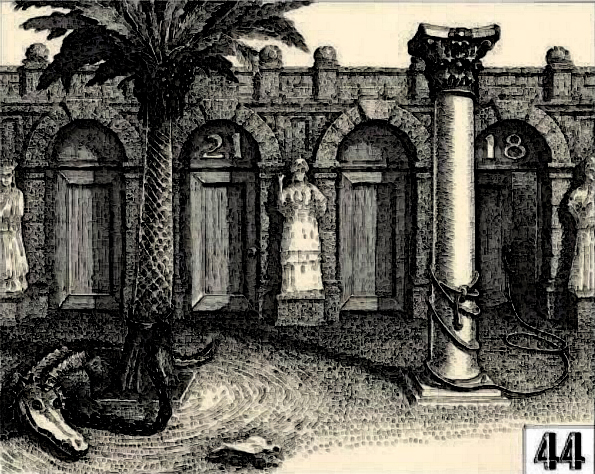 …a courtyard of palms and statues. The trees waved to each other in the breeze. “Who left the door open?” they wanted to know. “We came in that way,” I offered, but they were convinced we had entered by another door entirely. ● The reptile circling the palm tree gives us the phrase “vicious circle.” The reptile is drawn to emphasize the mean look on its face and the reptile is chained to the palm tree so that it goes around in a circle. “Vicious circle” indicates the reader’s sad circumstance being in this room and warns the reader away from door 21. [Independent Credit: Aria | White Raven] Also the tail of the reptile points to door 21, strengthening the association. [Credit: sp] Conversely the rope looping round and round the pillar on the right but eventually leading to the handle of door 18, indicates that this is the way out… but that escaping is yet a long way off. Possibly we are meant to follow the bird and fly away from the vicious circle. 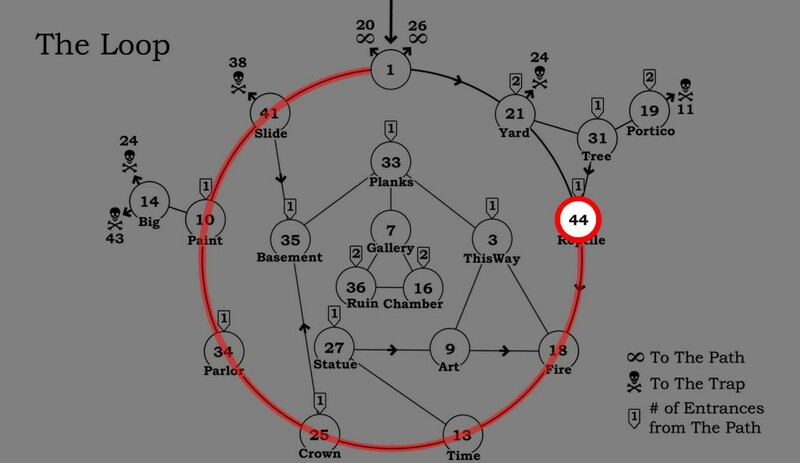 Someone probably already said this, but it seems like the Guide is misdirecting the group away from room 18, telling them they came in that way. An interesting bit about this room that is a trick is the fact that the statue is waving you towards room 21. The statue bears a remarkable resemblance to Athena, who in Greek mythology is the goddess of wisdom. One would think that the goddess of wisdom would know the way to go, and direct you in the correct direction. However, another genius in the field of mazes, Daedalus of Greek mythology, built the Labyrinth, an enigmatic and dynamic structure much like this Maze. Awhile after he escaped his own Labyrinth, he tried to kill his incredibly wise and intelligent nephew Perdix (alternately Calos or Talus) by leading him to fall off a tower. Athena saved Perdix by turning him into a bird before he could die, and punished Daedalus by leaving a mark of a bird on his shoulder to remind him of what he had done for the rest of his life. In this way, Athena might be inclined to misguide the guests in the Labyrinth and lead them to get lost, so they could not destroy wise people such as Perdix after they escape as Daedalus did. The notion of the bird leading the guests to freedom through door 18 might also have the connection to Perdix, who escaped certain death by being transformed into a bird. Thus following the bird will save the guests from certain doom. You could be right. I don’t know. It is a lot to get from the statue, but I really liked reading your post. I had never even heard of Perdix before! Although reptiles and birds both lay eggs, only reptiles are cold blooded, Manson could have associated the “colder” with 21, a-la room 3. Whether or not the bird is stalwartly walking towards 18 is up to debate, but I’d say the croc is certainly associated with 21 as its tail points to it. It looks to me as if the bird is just going away from the reptile at a leisurely pace. I think we are meant to hope the bird escapes the jaws of the reptile. The left and right symmetry of the palm tree and pillar was so obvious that I hadn’t noticed the tail of the reptile pointing to door 21. Nice! Adding it to the solution summary. This room is all about captivity and freedom. “Free as a bird” is a common expression, and here the bird is free – the room is open to the air and it can presumably fly away any time it wants to. The reptile, on the other hand, is chained up. How is this a room solution? The reptile “belongs” to the palm tree not just because it is chained to it but because they share features: both are dark green and brown in colour, the reptile has scaly skin and the tree has scaly-looking bark, the sharp-looking leaves recall the reptile’s sharp teeth, claws, back ridges. Reptile and palm are clearly associated with door 21 because they are beside it, and because the reptile’s tail points to it. If you take door 21, you will keep going around and around in circles in the Loop like this poor guy. Similarly, the bird “belongs” to the column. Both are white in colour. The column’s leaves look like feathers. The single eye visible on the bird matches the prominent circle at the top of the column. I think the bird USED to be attached to the column by the rope, but it escaped. Now it is a FREE BIRD. If you want to be a FREE BIRD too, take door 18, the door associated with the column and therefore the bird. You can free the doorknob on your way out, if you like. It’s just loosely looped on there to emphasize that it is not a restraint – same goes with the knot on the column that is NOT really a KNOT. Final bit that may or may not be part of it – the reptile is much bigger than the free bird, telling you to go with the small number (18 not 21) if you want to get free of the Loop. Open door = good, closed door = bad further works with the freedom/captivity solution. The thing about the trees waving in the text is just to remind you to wave goodbye and say “See you later, alligator” as you leave. Vewatkin has greatly improved on this idea by noting that “later” could be written as “18r”. The reptile (which Manson is careful not to name directly) isn’t an alligator or a crocodile. The guide says so to the guests, who mishear him. It’s not that they came in that way. It’s that there’s a CAIMAN that way. Another geometric shape one: The little diamond shapes on the trees can be lots of 8s if you put two together with each other and the tree is the 1. Apparently there was a Mycenaean Tree and Pillar cult. I wonder if that has anything to do with this room…? The shadow of the pillar falls on door 22. It would look like it is pointing to it, but it is a shadow, and we all know the Maze doctrine Light=Good, Dark/Shadow=Bad. That leaves 18, which isn’t necessarily bright, but at least it doesn’t have a giant shadow pointing at it. D is for Door — the correct one! PERHAPS inspired by Alligators All Around, an alphabet book by Maurice Sendak that was published in the sixties? Actually I guess you would call that a Corinthian Capital on a Column. CAPITAL… like a capital letter, maybe? Hmmmm? OK, I lied. I have more to say. Palm trees belong to the family Arecaceae… so the Alligator is going Around and Around a member of family Arecaceae. Wish I could figure out a B word for the statue (something about its weird headgear, maybe?) but all I can say is that it is Beckoning to the Bloody Bird. Unless the statue is a Bronze, but doesn’t look like it. Oh lordy. Could her hat possibly be a Beanie? With the lower part of the recess in the wall camouflaging the propeller? Well, I am just going to say it. I am disappointed that this is not a thing! There’s even a nice pointy Elbow after the Door!